“Have you tried Thai BBQ before?”, my husband asked me on our first day in Singapore last month. It was his birthday when we arrived for our long weekend getaway and I told him he’s got the freedom to choose what he wanted to eat for dinner. To answer the question, no I haven’t tried Thai BBQ before - not in Thailand, nor in the Philippines. 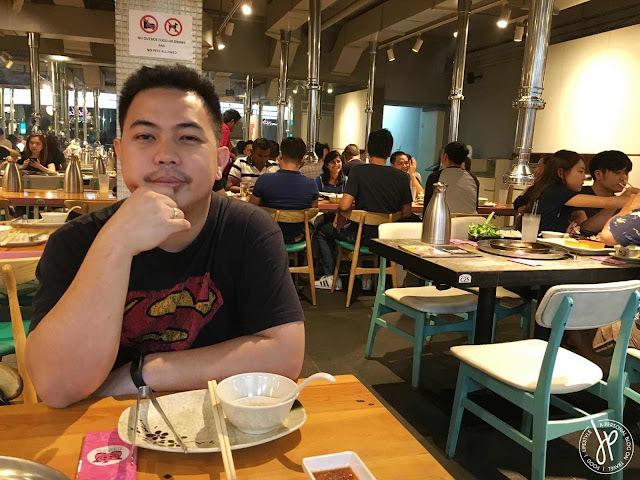 Because he stayed in Chiang Mai in Thailand for two months during college, my husband missed the food he had eaten so frequently back then. Apparently, he already scouted for restaurants within the area surrounding our hotel in Katong where we stayed. 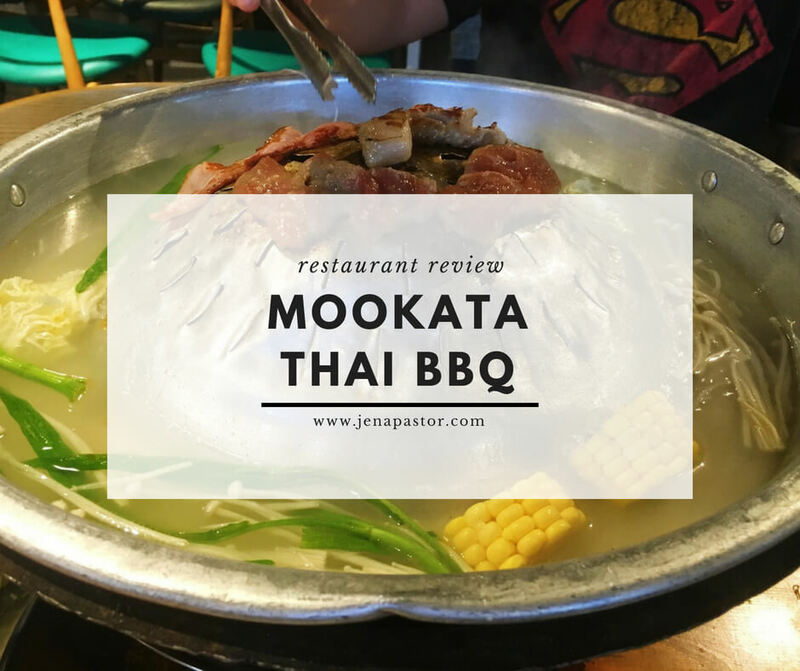 Just across the street from our hotel is Mookata Traditional Thai BBQ restaurant. 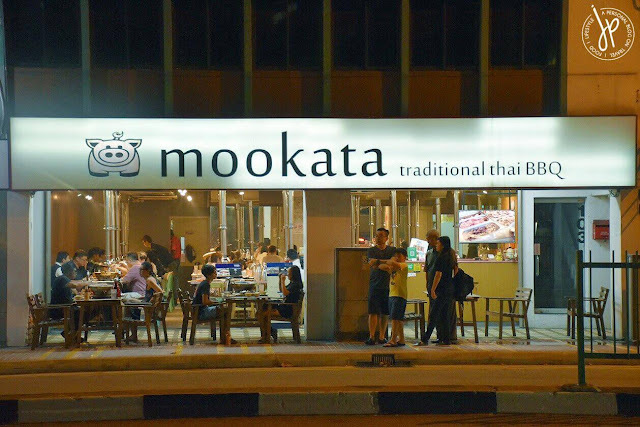 Mookata is situated along a strip of restaurants in East Coast Road and it is easy to spot this Thai BBQ place. First, it’s a semi-open and ventilated space (no AC). 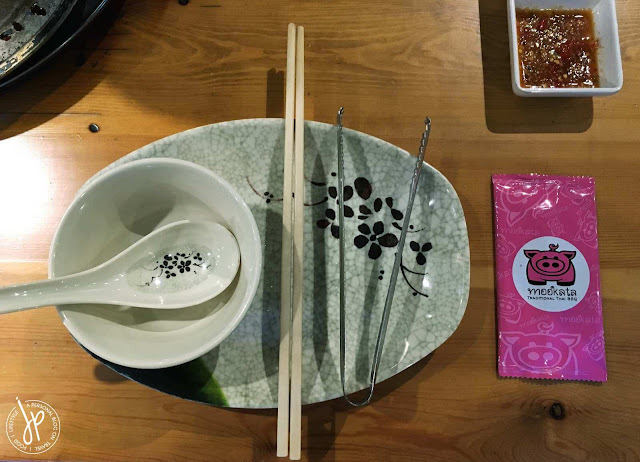 Second, the pink pig icon is easily recognizable. And third, the restaurant is almost always packed with customers. We’re lucky that by the time we got there, a couple was just leaving their seats. Instantly, a table was cleared for us. The servers were attentive and they were quick to clean the area for the next group of customers. 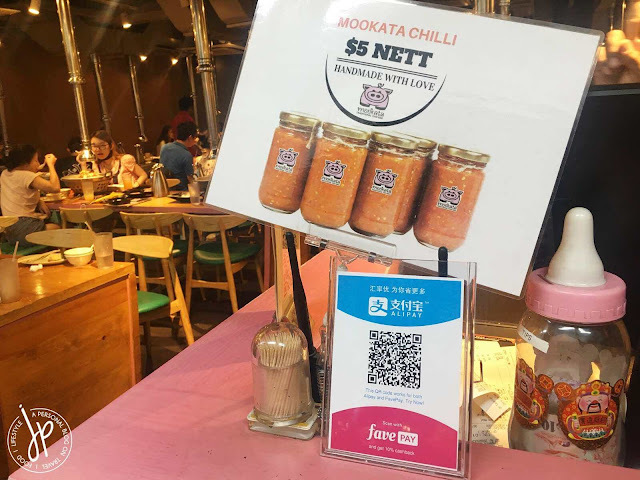 Mookata’s menu comprises of meat, seafood, vegetables, surimi (such as crab sticks, squid balls, and other seafood ingredients for shabu-shabu), finger food, noodles, tofu, and drinks. They also have a set menu if you want a little bit of everything. What I like about their order process is that it’s very high-tech. 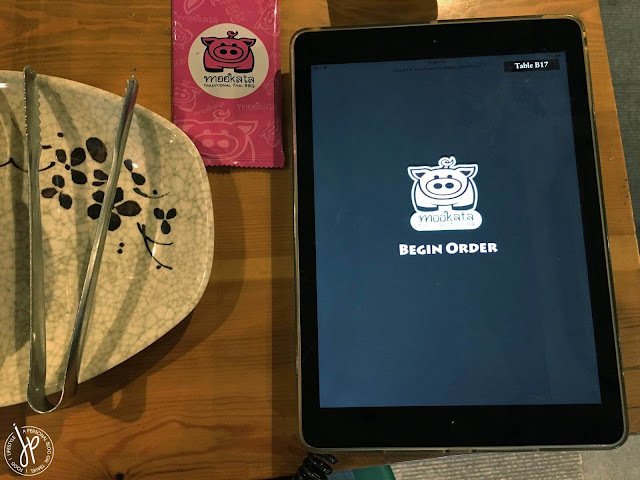 They do have the usual menu printed out, but they also have a digital one in an iPad. Simply pick which ones you like and once you added them in your cart, all you have to do is press order. No need to wait for a staff to attend to you. You can also see the total cost of your food. The only downside of this is that once you submitted your food preferences, you can no longer retract or make changes. 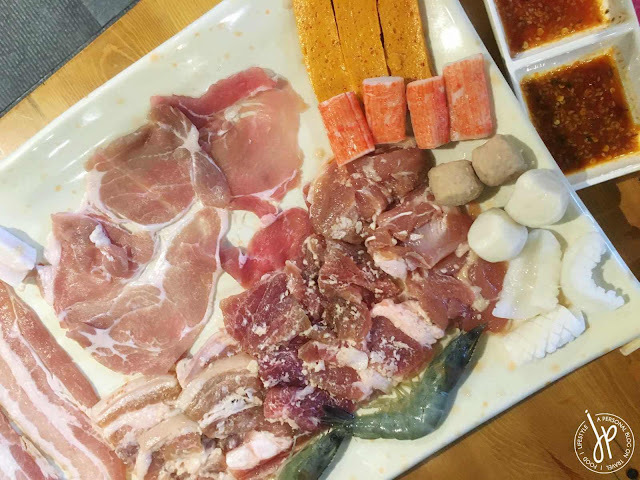 We chose the meal set for two, which consisted of a plate of different meat cuts (pork belly, bacon, sliced beef, chicken thigh), prawn, squid, fishball, meatball, crab sticks, and fish cake . 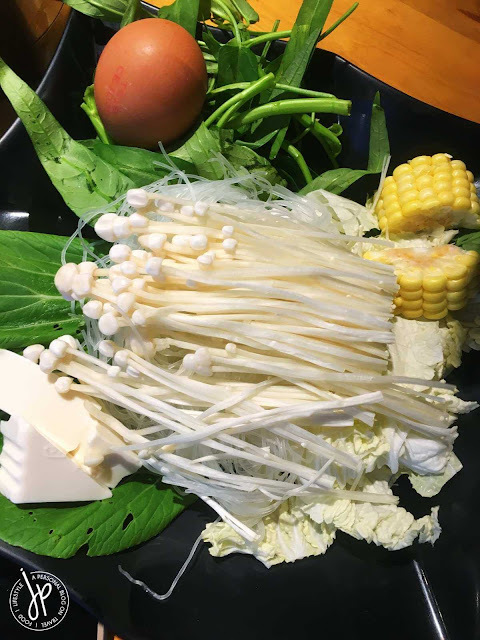 We also had a bowl filled with corn, tofu, leafy greens, noodles, mushroom, and fresh egg. Aside from the set menu, we also ordered two cups of rice and two cans of sodas. When our food arrived, the server also provided us with three Thai dips: mild, medium spicy, and super spicy. Basically everything was sweet and salty, with varying degrees of spiciness. 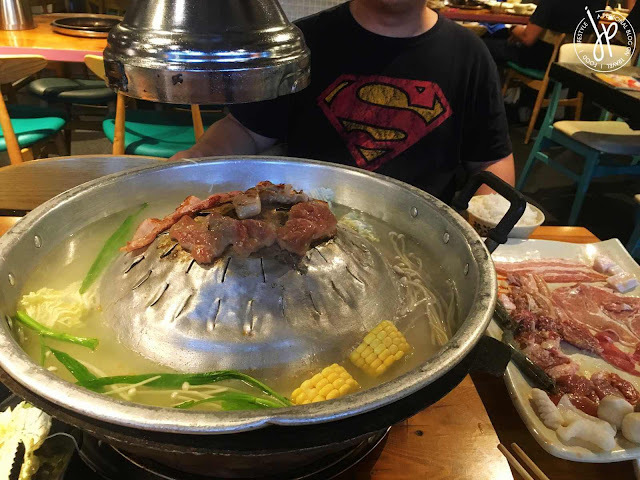 What surprised me the most is the domed shaped steamboat. It’s like a huge basin with a bowl (dome) turned upside down in the center. 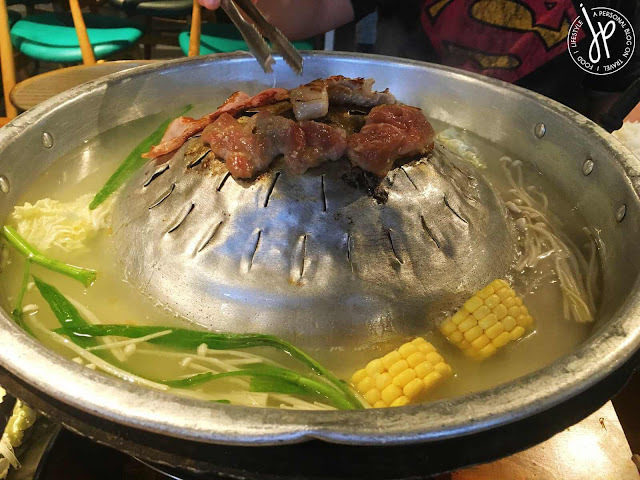 The dome part is where you grill your meat and the basin part is where you pour the pork broth from the pitcher. Inside the dome part of the steamboat are coals, keeping both the grill and shabu-shabu parts hot. We started greasing the domed grill with pork fat. Once the grill was covered with organic, natural oil (LOL), we started adding meat. While the meat was cooking, I poured in the pork broth and small portions of surimi, tofu, noodles, mushroom, and leafy greens (bok choy and kang kong, I think). The pork broth was light with just the right amount of saltiness. But what makes the soup more tasty is the meat’s oil and juices that drip from the top of the grill to the sides until the oil combines with the broth. On our third (or fourth) batch of grilled meat and seafood, we added fresh egg on the broth. The broth is the only free refillable item on the set menu. Initially, I felt the broth tasted bland. However, it became really tasty when the barbecue juices started dripping on the sides of the grill and into the broth. Some of the meat were marinated while some were just plain slices. I can’t decide which ones are the best because they were all delicious, but I’d probably go with the pork and chicken slices. The dipping sauces also made the barbecue more appetizing. You can get used to the three spice levels in no time. If you’re a heavy eater and a meat lover, I suggest ordering another plate of your choice meat as add-ons. For me and my husband, the set meal for two was enough. After our sumptuous dinner, we paid directly at the counter before heading out to dessert. We spent more or less a total of SG$40 (around Php 1,520) for our dinner and that included the seat meal of SG$34.90 plus rice and drinks. I enjoyed my first traditional Thai BBQ experience here so I’d definitely come back. I'll try the Tom Yum soup base next time. For those who’d like to try Mookata, I suggest you wear light clothes and a pair of jeans you’ll use for the last time before you wash it. That’s because you’d really smell like barbecue and smoke from head to toe. A shower after Mookata is a must!